Generations of seniors, new Canadians, students and residents in Sandwich Town have depended on this post office. Since 2011 there have been many offers from the community to work with Canada Post in finding ways to repurpose the space and bring in additional revenues. We'll just have to keep plugging away and find alternative uses for this historic building. 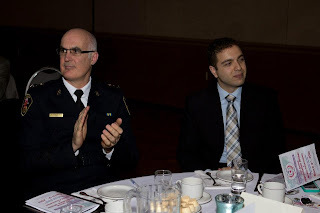 I sat with Windsor Police Chief Al Frederick at the 2nd Annual SCW Appreciation Dinner. I asked him if Windsor Police have a unique strategy for the west-end regarding crime prevention and reduction. He assured me that much energy and resources are deployed in our area. Let's continue to work together, developing neighbourhood watches, sharing information and working closely with Windsor Police to make our west-end a safer place for all families and residents. I met with Yin Zhang from the New Canadians' Centre of Excellence Saturday. She is located in Brock Library in Sandwich Town and primarily serves the new Canadian population in the west-end. We look forward to a great partnership in serving families, newcomers and residents in our west-end community. Hope you're having an enjoyable weekend. Let's hope we get some spring weather sooner than later! I want to thank all of the volunteers who helped deliver over 1000 flyers on Saturday in the neighbourhoods surrounding Mic Mac Park, Windsor Regional Hospital and St. James grade school. We are building a better community, block-by-block, neighbourhood-by-neighbourhood, making our west-end a better place to live, work and play. WELL, FEBRUARY WAS NO LESS BUSY THAN JANUARY! WE GOT ANOTHER CLOTHING DONATION FROM KELLY MARION. "THANK YOU!!" OUT OF THAT, ALREADY SOLD ARE THE THREE PAIRS OF SHOES FOR $5 EACH, WHICH GOES INTO THE POT FOR OUR CHARITY YARD SALE ON MAY 25TH! AS STATED EARLIER, THERE WILL BE A CHARITY YARD SALE ON MAY 25TH. NOTHING OVER $5! MORE INFORMATION TO COME. At City Council budget discussions, Councillor Jones had mentioned that South Tilston Park will not close due to a city wide study of parks that has yet to begin and will take several years to complete. Therefore, as of now, the parks located in the Bridgeview neighbourhood are not at risk. This is great news for the residents of Bridgeview and the west-end in general. I do not believe a second public meeting with City Administration will occur now given this recent revelation. In the meantime, it would be wise to think about creating a Friends for Bridgeview Parks committee to ensure that our parks are not only preserved, but also conform to the needs of the neighbourhood. More to come in the future on this. I will keep you posted if I hear anything further.